Crafting can be expensive, but it doesn’t have to be that way. 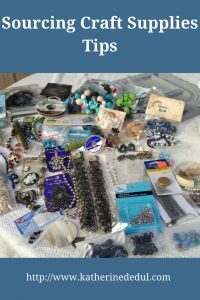 Allow me to share with you what I do to find quality crafting supplies on the cheap. If you like what you see or have a suggestion or tip, let me know in the comments down below. I’ve love to hear from you. If you’re feeling particularly generous, I’d love to count you among my email subscribers, the sign-up form is on the sidebar. Seriously, Amazon sells almost everything and anything you could want. I love LolliBeads (TM) Wholesale Mix Lot 10 mm Briolette Faceted Rondelle Crystal Glass Beads For Jewelry Making with Container Box (300 pcs) however, you can find all sorts of lovely kits and smaller sets on there. Under $20 for over 300 pieces of jewelry is pretty darn good in my books (I certainly couldn’t snag that at Michaels!). There is a slight risk of deformed beads, but you stand that risk when you buy a large package in a store as well. Plus if you’re like me, you have several projects on the go. There’s just something great about a one-stop shop. Your supplies might arrive at different times, but you can order it all in one go which is super convenient and useful for someone who is busy with life in general. I don’t have a lot of experience with eBay, but you can find some great deals on the auction site. As I don’t typically use them, I don’t have a lot to say about it, but wanted to mention it because I know people who swear by it. I love to visit my local stores, you can find very unique pieces to craft here for the most part. They can be on the more expensive side, but if they have a mailing list or a social media page, check them out, they will usually advertise deals they might have going on. In Canada, it’s Michaels, but you lucky peeps in the States have Joanne’s, Hobby Lobby, etc. I have to shout out to my former employer (Michaels) because they do have some excellent beading supplies and yarn. If you hit it at the right time, they’ll be clearing some stuff out to make room for the newer supplies and you can usually snag a pretty sweet clearance deal. The big box store will usually have fairly decent prices, I will use them when there’s a sale (online flyers are your friend folks) or coupon. They will have more generic items, so if you are looking for something unique or specialized, you may have better luck online. I just got introduced to Createforless.com and they are amazing! The best part for me is they offer shipping to Canada (and a few other international locales too FYI). So far I’ve only ordered a few little things through them, but I’m confident larger orders will be just as successful. They also have a lot of things that I can’t find at the Michaels here in Kelowna. Their prices are very similar to the big box brand stores, but I like them because it’s in stock if I can order it. Kelowna is about a forty-minute drive from where I live, so if I’m looking for something specific, sometime’s it’s best to just order it online versus going into Michaels. They also offer free shipping in the United States for orders under $50 (I am slightly jealous of my American neighbors in that regard!). 6. LetGo, Facebook Marketplace, Kijiji, Etc. I’d be remiss if I didn’t mention these. Often you can find someone who is getting rid of unused crafting supplies on these websites (or even a garage sale). Often they just want these items out of their hair, so they’re willing to let them go for whatever they can get for them so it’s a perfect time to make a deal.